Chalkdust and Boots: Fun with glasses! "I approached Chalkdust and Boots with a challenge - create some looks that represent you and the things that inspire you using Warby Parker eyeglasses. I love the idea of having glasses that you can tailor to a certain event or activity, based on your life, and at Warby Parker we want your glasses to reflect you and compliment your individuality and style! With the central idea of choosing glasses that represent her in any possible situation or event, Chalkdust and Boots created some awesome clothing and accessory combinations with the help of the Warby Parker Home Try-on program, where you can pick 5 frames for 5 days totally free. Check out her looks below!" So after a flurry of e-mails between Kaki and me, we came up with the idea stated above: feature at least five frames with five different outfits in order to showcase how glasses can really influence and enhance what one is wearing. 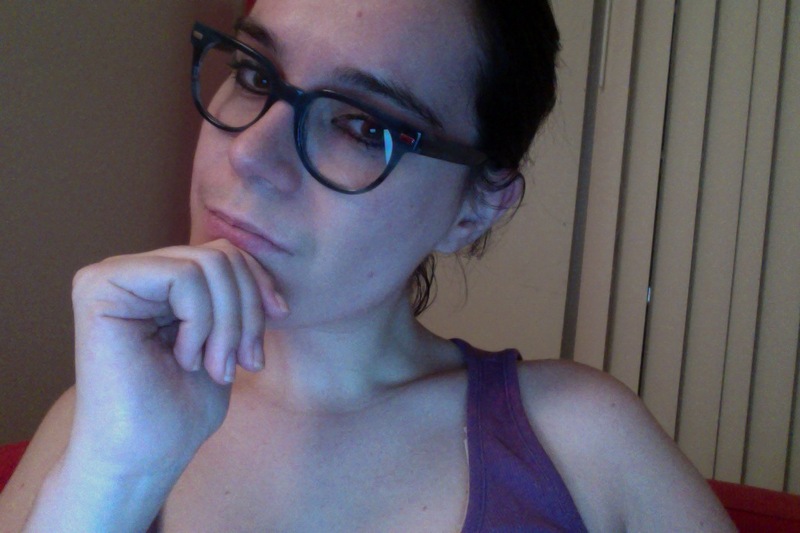 As you all know, I tend to be a one-pair-at-a-time kind of girl, so this was kind of fun in getting me to think outside the box and to really view glasses as a fluid and subtle accessory. Because I've had a hell of a week, I'll be showing you a picture of each frame in close-up and an outfit featured earlier on the blog that I think could've been improved by this frame (so get ready to see some older hairstyles!). ... Ahh, yes, crisp button-down, classical pencil skirt, sedate flats - wouldn't these glasses break up all that dark color, what with my tights, skirt, and hair? I mean, I loved my Ray-Bans, but these would look pretty sweet out on the town. The perfect combo of geek and chic. *Gasp* You guys, I just noticed they came in this color. I think we found my back-up pair!!! Poetry event in spring of 2011 - remember when I cut off all my hair?! Not-so-fun fact: my husband didn't like these as apparently he had multiple girlfriends who wore red frames (I told you we all went through this!!!). Oh, well. While the shape and the size of these frames are not my usual cup of tea, I couldn't resist the pretty color and the way they looked on the model. Plus, something about those pronounced edges (plaques?) spoke to me. 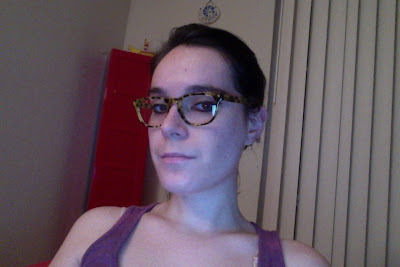 And I'm so, so glad I did try them on, cuz look! Early 2011, tutoring session. I wore this exact outfit on Wednesday, only with light blue boots. There was blue everywhere. Yeah, the Duckworths would've looked real good with the above outfit, I think. Especially as I wore so many blue accents this particular week. And I think my kids would've loved those frames. 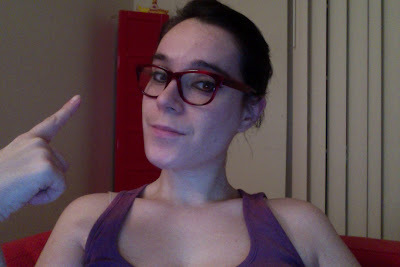 So, yeah, that was my most recent Warby Parker experience! What do you guys think, Style Nation? Do you see glasses as purely functional or can they accentuate your look? Are you a one-pair kind of person, or - if funds were unlimited - would you buy a bunch of different frames for different types of outfits and situations? Did you love any frames up here? I'd love to hear from you! I'd also love to thank Warby Parker and Kaki for letting me indulge in one of my favorite pastimes - trying on glasses - in the best way ever: in the privacy of my own home! I'm not quite sure what frame I'll go for after my next appointment, but there's a very big chance that Warby Parker may be involved! Good night! Happy February! Have a great weekend! I think the Tenley style is my favorite of the ones you tried. 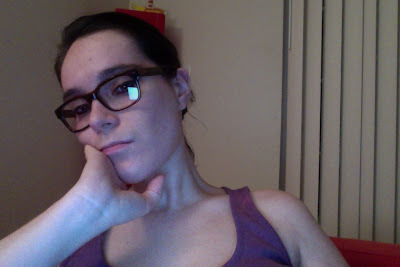 I definitely see glasses as a functional accessory and have several pairs. In fact I have a new pair arriving to me on Monday! These are all so fun! I think the Preston and the Sloan are my favorite. I always love tortoise shell, and the red looks awesome on you! I wear glasses for reading/computer use, so not all the time, but a lot of the time. I definitely like them as an accessory. I have 2 pairs right now, one of which I just got this week. 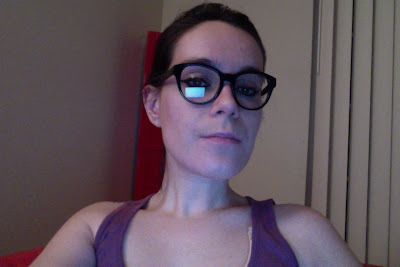 They're the Kensie Uptown frames in navy - I wasn't sure about getting away from blacks and browns, but I'm really happy with them. And they're neon yellow on the inside, so everything looks brighter! Thank you for the descriptive and very informative blog. An enjoyable and helpful read!